Okay, so I know this isn't your typical book review, but this book is too much fun! Its a cool green color, and the title is really catchy! I saw it at Barnes & Noble right before we entered, and to be honest, it just really stood out from the rest of the books. That's why I grabbed it. Not to mention I set the door alarms off when we entered...oops! 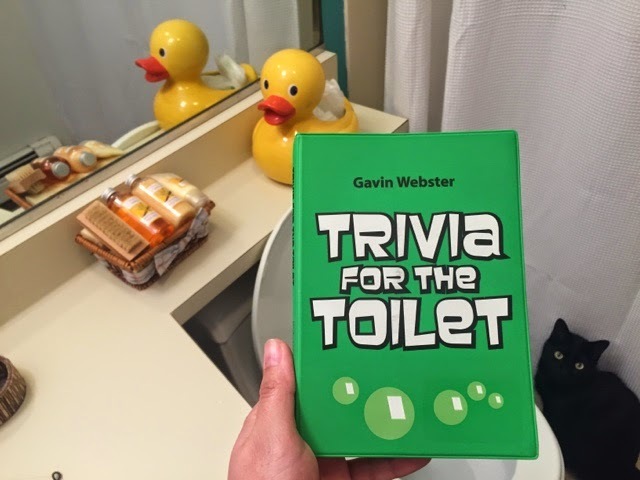 Trivia For The Toilet by Gavin Webster is a great little book about everything! We all love to know a little something about everything, and that is what this book is all about. * The yo-yo was introduced in1929 by Donald F. Duncan. The toy was based on a weapon used by 16th century Filipino hunters. *A jiffy is an actual unit of time for 1/100 of a second. *The English word "soup" comes from the Middle Ages word "sop" which means a slice of bread which roast drippings were poured. The first archeological evidence of soup being consumed dates back to 6000 B.C.E.with the main ingredient being hippopotamus bones. *in 1945 a computer at Harvard malfunctioned and Grace Hopper, who was working on the computer, investigated, found a moth in one of the circuits, and removed it. Ever since, when something goes wrong with a computer, it is said to have a bug in it.